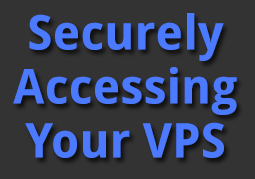 This post is all about Securely Accessing your VPS. There are many different methods to access your VPS. Some are more secure than others. We will go over some of these methods in detail and help explain why you should or should not use each method. But you will how to access your VPS securely. Back in the early days of the Internet before everyone was really concerned about security in general most folks used an unsecured protocol called Telnet. The problem with Telnet is that everything send and received is in clear text including your passwords. As you can imagine Telnet is not widely used anymore as most everyone now uses ssh. We just thought we would mention telnet in case you ever come across it. You know to disable it right away and start using SSH. SSH is a powerful and secure way to access your VPS and the one we recommend you use. SSH encrypts all traffic (including authentication and passwords) between two hosts. You can also tunnel TCP ports through your connections and securely access services on the remote machine. In order to connect with SSH to your VPS you need a SSH client if your running windows.We recommend a program called putty. We like it cause it is free. You can get it here: http://www.chiark.greenend.org.uk/~sgtatham/putt/download.html. Once downloaded and installed, setup a new connection to your VPS IP and enter ‘root’ for the user-name and connect. Once connected you will be prompted for your root password. You should have received this in the email you received from ZoomCloud.net. Enter your password and hit enter. Now the first thing you should do is create another user (‘useradd “newusername”‘) and make sure that user has access to su or sudo to root. Once you are sure of this, you should disable root logon by editing /etc/ssh/sshd_config. We have this detailed in another post called Securing and Using SSH. Most webmasters are familiar with FTP or File Transfer Protocol. Its been used commonly to upload websites to hosting providers for ages and is still used today. The problem with this is FTP again is an old protocol and does not even think of security. All data is transferred in clear text including your passwords. We don’t recommend you use FTP but if you must here is how you do it. Once installed and open, In the quick connect bar, enter the IP address, username and password and for port enter 21. Click connect. You should now be connected to your VPS. But wait there is even a better way to transfer files securely between two hosts. Its called SFTP. SFTP Combines the ease of use of FTP with the security of SSH. Again you need a client (yes CLI options are available in Linux and Mac) but you already have it. You connect the same way as you do for FTP, but this time instead of port 21 enter port 22. Its as simple as that.